Thank you for all your kind comments and suggestions on my last blog. The postmortem results were helpful, not least because they gave us some reassurance that the problem was not something herd wide. However, the lost of an alpaca, especially a cria, does leave you vulnerable to over reaction. So when Sox came in with the rest of the herd yesterday morning, and promptly collapsed in a heap amongst the poo; the scream could be heard through the valleys. She had appeared absolutely fine when she was fed at 6.00am. Oh no, this had signs of deja vue. I shouted for Paul to call for the vet, but then she came back round and seemed okay. We cancelled the vet, thinking that she had just been knocked on entering the barn, and that I had been over sensistive after the lost of Kitten. We gave her a good examination, all appeared okay and her temperature was within normal range. However, last week we had been concerned about not seeing her pass faeces for some time. She hadn't been straining, but nor had we seen any poo (granted we are not in the paddock 24/7). So last Friday we had given her a soapy enema, with a good result. Hence we decided to do the same again. But as soon as we had given it to her she collapsed again. The vet was recalled and Soxs had a further 4 episodes of complete collapse before the vet arrived. Watching her it looked to me like colicky pain, but so severe that it was causing her to collapse. We gave her some Finadyne whilst waiting for the vet to arrive, as well as some water with electrolytes. Buscopan was given intravenously by the vet with good effect, and a Microlax enema was also given. However, Buscopan has a short life and within a couple of hours the pain had returned (although not quite as severe as before, but enough to have a writhing about). A different vet arrived this time, equipped with an ultrasound machine. The good news; no complete obstruction was found, nor any perforation, but lots of faecal matter and gas within the intestines was seen. Sox was given a further I.V dose of Buscopan and 1 litre of Normal Saline. She was also given I.V. Norodine just in case there was some parasitic involvement that wasn't presenting itself as diarrohea yet. To say I was a little stressed yesterday would be an understatement. It is impossible not to get overly attached to any hand reared cria, and when you are her only mum it is especially so, but in addition to that she is just gorgeous. Even the vet was smitten. But Sox is a fighter and is much better today. She is continuing on oral Norodine and live goats yoghurt. She is taking her bottles well, but we are feeding her small amounts 2 hourly. I have also given her some Lactulose to see if that will help loosen things. Fortunately for Sox, although she may not have a mum who loves her, all of the other cria certainly do. Lullaby has totally adopted her, and is always watching out for her. But the sweetest thing yesterday was Domingo, he knew she was sick, and spent all his time beside her, letting her sleep with her head on his back. Beck Brow Domingo caring for Beck Brow Foxy Sox. Ironically that is Beck Brow Roma (Sox's mum) lying asleep behind them without a care in the world! A lovely sight - Lullaby and Sox running off together after being fed. As we are getting late in the year, we decided to spit off all of the females this morning. As Explorer is so well behaved, he always gets the job (but he did get 2 matings in return for his efforts). We have the potential to have 33 births next year if all of our females get pregnant, and retain their pregnancies (unlikely with 20% loses being the average), but on the pregnancy front things are going well. Our only failure is Easter-Wood Metisha. It is a shame as we purchased her with Explorer in mind. Unfortunately, she came to us empty, and she has got rather lardy, increasingly so as time as gone on and we have failed to get her pregnant. We have tried her with St Patrick as well as Explorer, but both boys have failed. She ovulates but doesn't get pregnant. I think that we have left it too late to get her slimmed down now. How annoying when she has been mated since May. We have mated Roma with Explorer, she was totally loved up, so lets hope that she loves her cria next year. We did decide to mate Lucie (the girl who had the prolapse) a couple of weeks ago, however she seemed a bit fidgity when being mated, so after 7 minutes Explorer was removed. However, she also spat off at her pregnancy spit off! All of the spit offs went very smoothly, we have a great system going where the girls are fed past Explorer...he sniffs...they spit...NEXT! I do however have a rather large bruise. I forgot that we have a new girl. I like to think that my girls like me...it may be more a case of not biting the hand that feeds you...but they don't kick...the new girl Ardo Jet?...Ouch! Finally; maybe we can excuse Paul this year when he gets his cria identification wrong....Waradene St Patrick of EPC is certainly producing look-a-likes...good job that he is a handsome boy!! Beck Brow Advantage with Beck Brow Paulo in front. P.S Fingers crossed that I will have no more cria health blogs for a long time please. What a gorgeous photo of Sox with her "minder" Domingo! Do hope she continues to improve and that you get to the bottom of whatever the problem is. Crikey, drama at Beck Brow! Sounds like you have it all under control, fingers crossed. Lovely pictures as usual and Sox really is a cutie! I'm with Judi - those pics of Domingo and Sox are just too sweet. And talk about a double-take at the end!!!! I do love alpacas - and yours are just so darn engaging. What a sweet, yet ironic/tragic photo of Sox with Domingo and Roma asleep in the background! Sox is similar in appearance to our Delicious, and with bottle-feeding her twice a day, and seeing how she runs to me from across the field, I can well imagine how attached you inevitably become to one who is completely dependant on you. Good luck! We do give cows colostrum Jayne, but we have done so regularly for three years without any problems. 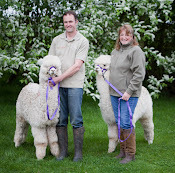 The cows are on our land and are taken home just before birthing , so have had similar exposure to our alpacas. Sox was okay the first week after having the colostrum and Lullaby has been perfectly okay. The vet thought (after examining her poo) that she is eating much more grass and hay than you would expect of such a young cria and her gut isn't mature enough to cope? Domingo, what a star ! I hope Sox pulls through. Good grief, Barbara, what a lot you are having to (very efficiently) cope with! Lovely, if slightly sad, pictures - hope all is well for Sox very soon. Glad to hear things now seem to be under control, you're certainly getting more than your fair share of things thrown at you. It's a good job girls are fighters!